Toast and bagels are our most common breakfast breads; I love sprouted wheat breads and bagels, but we also frequently have bagels from Seattle Bagel Bakery or (less frequently, sadly) Grateful Bread. Sometimes I’ll make a couple strips of veggie bacon to go on the side; sometimes I’ll make up some Vegg yolk, and sometimes, like today, I’ll have fruit. What do we top our toasted carby goodness with? Usually it’s homemade vegan butter and/or homemade jam. Bagels call for cream cheese, of course. The current vegan cream cheese love of my life is Nary Dairy‘s astoundingly good Roasted Gilroy Garlic cashew cream cheese, which we picked up at Vtopian‘s new cheese shop & deli in Portland. But this wonderful spread can’t be found in Seattle yet, so we live in sadness whilst consoling ourselves with Kite Hill‘s superb cream cheese (when we can bring ourselves to shop at Whole Foods, that is). We usually end up grabbing either Go Veggie’s or Daiya’s cream cheese at our vegan market. Coffee talk: as you probably guessed by my swipe at Starbucks, we’re pretty particular about our coffee (hey, we’re Seattleites!). We alternate between Ethical Bean Coffee‘s Lush or Rocket Fuel (DAAAAMN! ), though right now we’re drinking Grounds & Hounds‘ Alpha Blend, which we found at Food Fight on our aforementioned Portland visit. Coffee always gets Wildwood‘s soy creamer, because it’s the best. 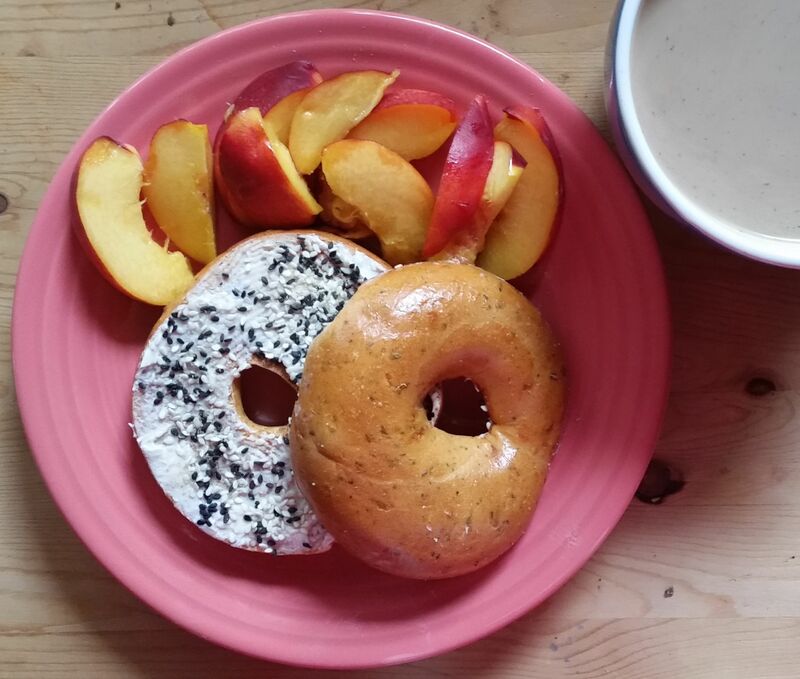 This morning I had a sundried tomato bagel (from Blazing Bagels) with plain Daiya cream cheese and garlic gomasio, along with a perfectly gorgeous and incredibly sweet local nectarine. And coffee! 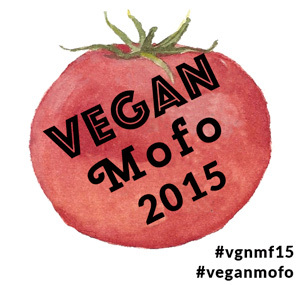 Happy first day of MoFo, veganland! ‘Til tomorrow! Roasted Garlic Cashew Cream Cheese better than Kite Hill??? I need to get over to that Vtopian store. Oh my GOD. It’s not as perfectly smooth as Kite Hill, but the flavor is incredible. It is, however, ridiculously expensive. I might have to Paypal you some money to bring us some of that and NuCulture’s bacon chipotle spread before the wedding. That stuff! Holy mackerel! If you do go to Vtopian, try a sandwich – they use Homegrown Smoker salami and ham, and the housemade cheese they use in sandwiches is really good. I had a NY bagel for the first time, it totally lived up to the hype! Thanks for the tip on Vtopia I’m heading to Portland next month 🙂 Love your guys portrait! I always thought the NY bagel hype was nonsense – but I was totally wrong! Have you been to Portland before? The vegan food there is unbelievable! I get so sad when Wildwood creamer is out of stock. I get all cranky, like, what even is the point of coffee with some inferior creamer?! That Kite Hill is magic. How is it so smooth and silky and delicious? !